The Eiffel Tower is 984 feet tall or 300 meters. On paper, it’s a number. In person, it’s surreal. Every year, nearly 7 million visitors explore the Eiffel Tower, also known as La Tour Eiffel, which means The Iron Lady. I always wondered how tall is the Eiffel Tower and I got to experience its vastness when I toured Paris, years ago. Have you ever wondered how tall is the Eiffel Tower? Watch my video tour to see how tall it is! Standing at the base of the wrought iron structure, I marveled at its engineering ingenuity. I had tons of design questions and I wanted to experience the answers. As you can see below, my excitement for Eiffel Tower extends beyond touring it. I couldn’t resist building an edible replica using fresh, plump blueberries. WATCH MY RECIPE VIDEO BELOW to see how to make Eiffel Tower using fresh blueberries. When I toured the Eiffel Tower in person, I was fulfilling a lifelong long dream and, like clockwork, I had caught a cold. Despite my runny nose, I stuffed my video camera into my bag nestling it between tissues and cough drops. I was on a mission to spend all day filming the tower. My cold would have to wait. As soon as I arrived on site, it was like magic. Suddenly, I could smell again, my cough subsided and my head stopped throbbing. Science would say that all the cold meds that I had inhaled is what relieved my cold symptoms. I like to think that my sheer excitement smashed my sickness to smithereens. 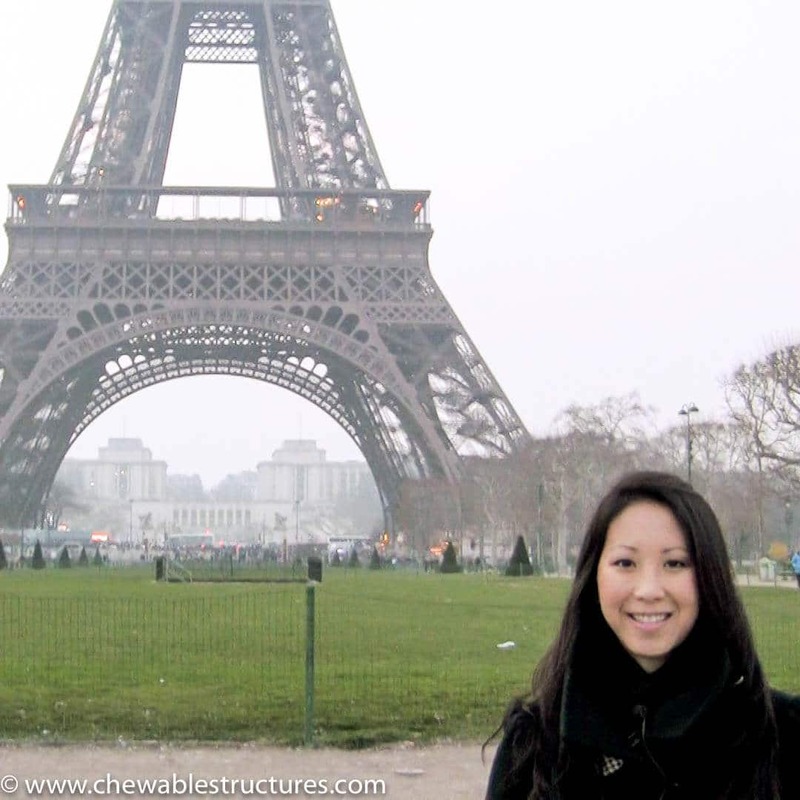 I ventured to Paris to answer a few questions. Here are the answers along with fun video tours capturing the precision of the iron structure, the breathtaking views from each floor, the scenic elevator ride, and even Eiffel Tower at night. Without the antenna, the Eiffel Tower is 984 feet tall or 300 meters. With the antenna, it’s 1,063 feet tall. The video tour below gives you a good idea of how vast the structure really is and some fun design facts. How many steps in the Eiffel Tower? Initially, I had grand notions of climbing the 1710 steps to the top of the Eiffel Tower, but tourists can only take the stairs to the first floor. Instead, I took two different elevators and zipped to the top in a double-cabin electric elevator. To catch a glimpse of what it feels like to descend in the Eiffel Tower elevator ride, check out the below video. Since the walls were glass, I was able to snag gorgeous views of the city. How many stories is the Eiffel Tower? The Eiffel Tower has three floors. The first floor is 187 ft (57 m) above ground and you can see the esplanade from the glass floor. The second floor houses shops and the Jules Verne restaurant. The top floor has indoor and outdoor observation areas. Each floor has observation decks that wrap around the structure so that you can get a 360-degree view of the city. Check out the video below to soak in the views from each floor. The Iron Lady is made of 7300 tonnes of iron and 60 tonnes of paint. Every seven years the tower is painted to prevent against oxidation. There are also three visitor elevators and one 4-tonne freight elevator. 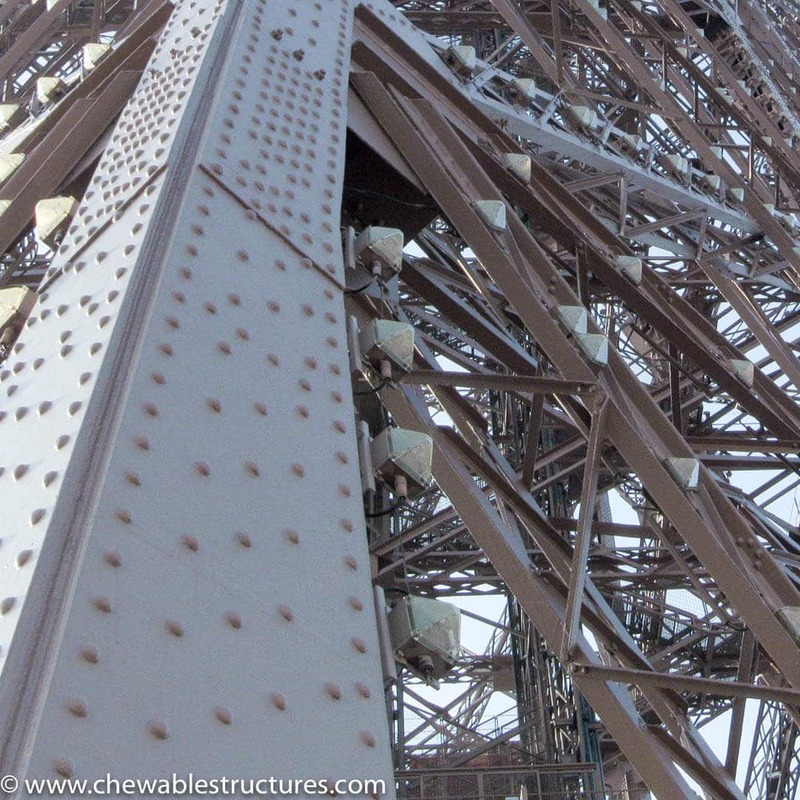 The iron work on the Eiffel Tower weighs 7300 tonnes. There’s another 60 tonnes of paint. How long did it take to construct the Eiffel Tower? It took 150 to 300 workers to construct the Eiffel Tower in 26 months and 5 days, including 5 months to build the foundation. Construction on the supports began on July 1, 1887 and the top floor was finished on March 31, 1889. In total, 2.5 million rivets and 18,000 pieces were installed. Eiffel Tower was the tallest structure in the world for 41 years until New York’s Empire State building was built. Below is a video tour of Eiffel Tower at night. What do you think of my video tour? Were you surprised about how tall is the Eiffel Tower? Leave a comment below and let me know what you think.